On October 24th, 2015, the International Brotherhood of Electrical Workers (IBEW) Local 840 dedicated their new training facility to Lawrence N. Davis. Larry, previously the IBEW Business Manager, was a founding member of the Finger Lakes Workforce Investment Board and dedicated to the school-to-career initiative. Mike Davis, Larry’s son and current Business Manager for IBEW 840, currently serves on the Finger Lakes Workforce Investment Board and is Chair of the “Finger Lakes Works…with their hands!” Career Exploration Day event. Both of these men are very dedicated to their profession and to building a pipeline of workers. We are proud to have them as part of our team! Pictured (left to right) Senator Mike Nozzolio, Larry Davis, Assemblyman Brian Kolb and Mike Davis. WAYNE COUNTY INDUSTRIAL DEVELOPMENT AGENCY!!! 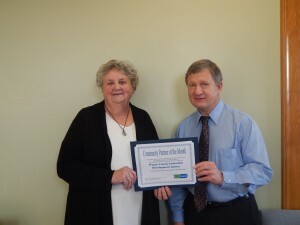 GENEVA, NEW YORK – The Finger Lakes Workforce Investment Board Inc. (FLWIB) announced today that Wayne County Industrial Development Agency (WCIDA) is November’s “Community Partner of the Month,” recognizing the agency’s efforts in working collaboratively with Finger Lakes WIB to address economic and workforce issues impacting the region. The Wayne County Industrial Development Agency is a one stop resource that provides site assistance and financial and tax incentives to accelerate companies in Wayne County. Through continuous outreach, inter-governmental partnerships and financial assistance, WCIDA initiatives have lowered the cost of doing business in Wayne County and the State of New York. They accomplish this by promoting growth in targeted industry “clusters” and addressing individual needs of Agriculture, Advanced Manufacturing, Service, Optics, Equipment Manufacturing and a growing Tourism Industry, Integrating the IDA with the Wayne County Economic Development and Planning Department in 2013 has expanded the scope of accessible expertise. ED/planning director Robert McNary became CEO of the WCIDA in early 2014, completing the process. Peg Churchill, Executive Director of the Wayne County IDA, is pictured with Robert McNary, CEO of the Wayne County IDA, receiving the award. 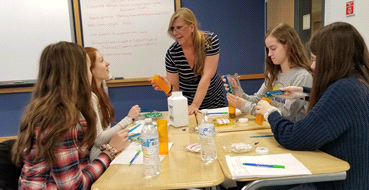 A member of the FLWIB since 2005, WCIDA executive director, Peg Churchill has worked closely with the Wayne County Workforce Development office and has been a strong advocate for the services provided, often referring companies in need of workforce development programs. Additionally WCIDA is a founding member of the Finger Lakes Advanced Manufacturing Enterprise, a group of manufacturers focused on the development of a strong workforce in Advanced Manufacturing. WCIDA is also a longtime sponsor of the Wayne County Job Fair scheduled this year for November 19th at Palmyra VFW. The Finger Lakes Workforce Investment Board, Inc. invites the public to attend the November 2015 Full Board Meeting. Please RSVP with your attendance to the Finger Lakes Workforce Investment Board by November 13th. For more information please call, 315-789-3131. G.W. Lisk wins NYATEP award! 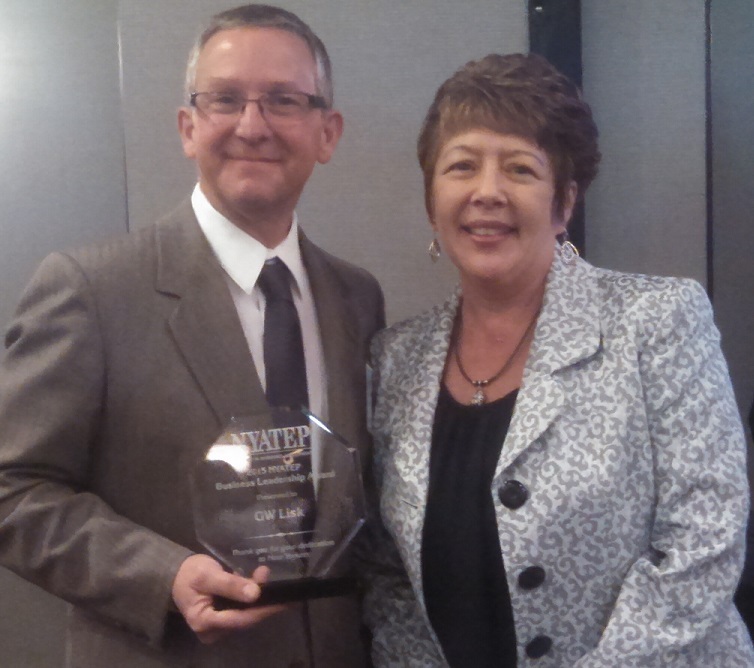 NYATEP’s Business Leadership Award recipient! November named Veterans Outreach Month! During the month of November we will be hosting numerous workshops and panels to promote hiring Veterans and to honor all those who have served. Please see the below flyer for dates and times of these programs. All are welcome! If you know a Veteran or an employer who would like more information on the benefits of hiring a Veteran, please contact a local career center noted on the flyer! There are SO many valuable opportunities for Veterans in the workforce and in training programs. Come be a part of these programs to learn more and connect with local employers who are proud to hire Veterans! MICROTEL INN AND SUITES OF PENN YAN, NY!!! 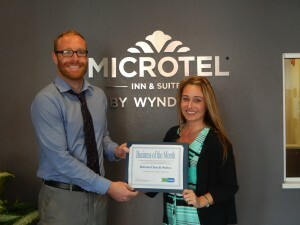 GENEVA, NEW YORK – The Finger Lakes Workforce Investment Board, Inc. (FLWIB) announced today that Microtel Inn & Suites is October’s “Business of the Month” recognizing the company’s efforts to build strong community partnerships along with their continuing contributions to the local economy. Located in Penn Yan, New York, the brand new Microtel Inn & Suites is four-stories, has 77-rooms and offers 18 spacious suites with separate kitchenettes and living areas as well as a host of other amenities including an indoor pool, guest laundry, complimentary breakfast, fitness center as well as meeting space. Part of Wyndham Hotel Group, the Microtel Inn & Suites by Wyndham® brand is an award-winning chain of economy hotels located throughout North America and the Philippines. Designed to provide guests with a better hotel stay, the brand was ranked highest in guest satisfaction in the economy/budget segment by J.D. Power in the most recent North America Hotel Guest Satisfaction Index Study. 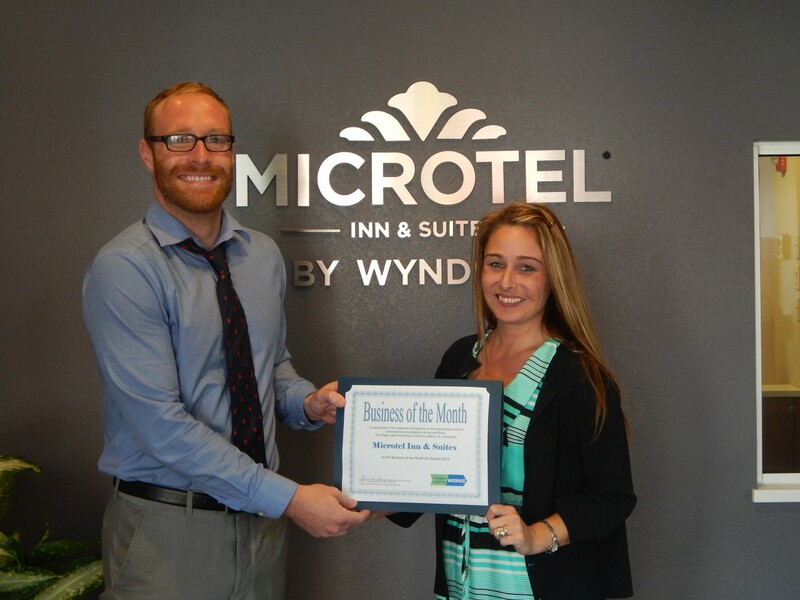 Nicholas Keegal, General Manager at Microtel (Penn Yan), and Tammy Murphy, Vice President for Indus Hospitality Group are pictured receiving the award. In March of 2015 during the initial construction phase Finger Lakes Works-Yates started to partner with Microtel in an effort to recruit for all positions needed to run the hotel. Services included promoting positions with in the career center and accepting applications along with posting jobs with the New York State Job Bank. As workforce needs develop over the coming years Finger Lakes Works will continue to work in partnership with Microtel. The hotel, which opened in August has twenty employees and is planning their Grand Opening on October 21, 2015, at 6pm. Minimum Experience Required: No experience requirement provided. Job Description: Effective Sep 30th, the Waterloo Premium Outlets will be hosting an Job Fair/Open Recruitment each Wednesday thru the month of October. The Wednesday events will be held in the Food Court of the outlet mall from 2-4 p.m. Attendees will have an opportunity to speak with hiring managers about these opportunities, submit resumes and complete applications. We have a diverse selection of retail and customer service employment opportunities that include full-time, part-time, seasonal and /or permanent positions in all our specialty stores that include: Designer Fashions and Sportswear, Children, Shoes, Accessories & Jewelry, Housewares & Home Furnishing, Gift & Specialty and Food & Drink. So what specialty store would be the perfect fit for you? Hope to see you there! The Waterloo Premium Outlets is home to more approximately 100 outlet stores. For additional information on the Waterloo Premium Outlets, please visit www.premiumoutlets.com/waterloo/. SENECA COUNTY INDUSTRIAL DEVELOPMENT AGENCY!! GENEVA, NEW YORK – The Finger Lakes Workforce Investment Board Inc. (FLWIB) announced today that the Seneca County Industrial Development Agency (SENIDA) is September’s “Community Partner of the Month,” recognizing the agency’s efforts in working collaboratively with Finger Lakes WIB to address economic and workforce issues impacting the region. The SENIDA is a public benefit corporation dedicated to ensuring the long-term economic health of Seneca County by attracting new businesses and helping existing businesses grow. The agency promotes private sector commercial and industrial development while advancing job opportunities and the economic welfare of the people of Seneca County. SENIDA works with site selectors, CEOs and business owners to make the most of the region’s numerous geographic advantages and exceptional workforce, forming partnerships that will benefit both the employers and the people that call Seneca County home. 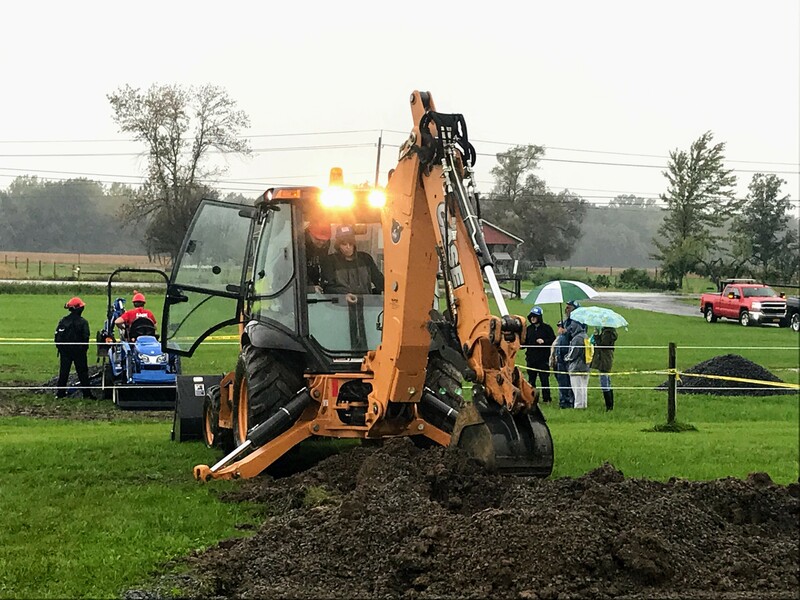 The SENIDA has been an important sponsor of Finger Lakes Works With Their Hands, a career exploration event for high school students in the region focused on Skill Trades and Advanced Manufacturing. This program exposes students to the careers that exist in these sectors while developing a “pipeline” of future talent. SENIDA partners with the Finger Lakes Works Seneca County Workforce Development office in an effort to help local companies find and keep a high quality workforce. Additionally, SENIDA is also a founding member and supporter of the Finger Lakes Advanced Manufacturers’ Enterprise (FAME). This group of manufacturers is focused on the development of a strong workforce in Advanced Manufacturing. The Finger Lakes Workforce Investment Board, Inc. invites the public to attend the September 2015 Full Board Meeting. Please RSVP with your attendance to the Finger Lakes Workforce Investment Board by September 14th. 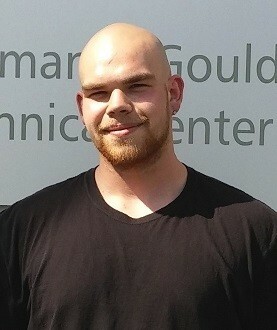 Codie Arno and Derek Mehlenbacher are two WIA Youth Program participants from Seneca County Workforce Development who have just successfully completed the FLCC Advanced Manufacturing Machinist training at ITT/Goulds Pumps. Both of these young men have accepted employment as full-time, Goulds Pumps employees! Congratulations and good luck! 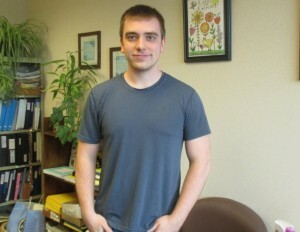 Pictured above is Cody Arno. Pictured above is Derek Mehlenbacher. Derek was the PY’14 WIA Youth Success Story from Seneca County. To learn more about his story, click here.